7. 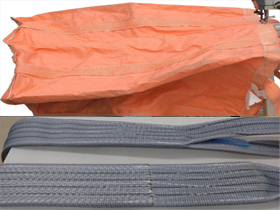 Its features a "free sewing" capability that allows the operator to sew in any direction, allows effective jobs for belt attaching on a container bag, enforcement belt sewing, sling belt , large size parts sewing and so on. Two needle independent row, double locked stitch machine for even matched seaming of Big Bag/container bags and simultaneously attaching belt band. Its design and pedestal installation makes it especially suitable for attaching filling and discharging tubes and inserting top covers. Guides for filler cord from the top and / or from below for sealing the needle punctures of the left needle. This Big Bag/Container bag making machine is interchangeable with Newlong DR-7UW and Union Special 80700CD series SINGLE NEEDLE AND TWO NEEDLE INDEPENDENT ROWS DOUBLE LOCKED STITCH MACHINES with Lower and Upper Feed. 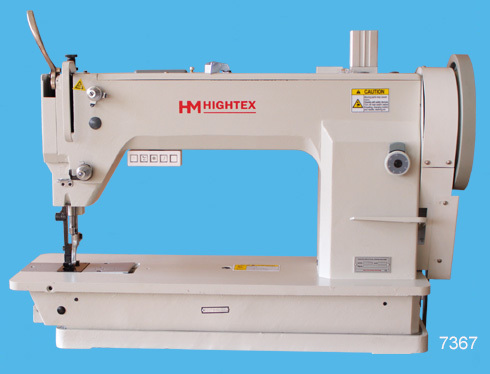 HighTex 80700C4HL Heavy duty single needle double locked stitch sewing machine with top and bottom feed for inserting top covers, attaching filling and discharging tubes on container bags. Two needle machine four thread safety stitch machine. Lower and upper feed. Adjusted for polypropylene sewing threads for matched seaming of very heavy bag fabrics make of jute, burlap or woven polypropylene with a 10 mm wide overedge stitch on the fabric edge and in a distance of 5mm (13 gauge) to this with an additional double locked stitch. This FIBC Big bag sewing machine is supplied with guides for filler cord from the top and / or from below for sealing the needle punctures of the left needle. High needle stroke sewing machine for very strong side seams in the production of very heavy weight jute, burlap or woven polypropylene bags (container bags). This Big Bag/Container bag making machine is interchangeable with Newlong HR-6 and Union Special 81300A series TWO NEEDLE FOUR THREAD SAFETY STITCH MACHINES with Lower and Upper Feed.